Echinacea, also known by the names purple coneflower, coneflower, American coneflower, black Susan, black Sampson, comb flower, hedgehog, Indian head, Kansas snakeroot, scurvy root, and snakeroot, is used for treatment and prevention of colds, flu, and other infections, for a long, long time. It is also used topical to treat wounds, burns and other skin problems like acne and boils and is believed to help the immune system fighting infections. Echinacea is qualified as an herb; the leaves, flowers and roots are used either fresh or dried for making tea, extracts, or are used external. Even though most of the times Echinacea does not cause any side effects when taken orally, some people may experience allergic reactions, rashes, increased Asthma, closing of your throat; swelling of your lips, tongue, or face and it can have some gastrointestinal side effects. If you get a fever, or experience nausea or vomiting, you best talk to either your doctor or the pharmacist, before continuing taking this supplement. In case you are allergic to ragweed, chrysanthemums, marigolds, and daisies, you may do well not to use Echinacea, because it belongs to the same plant family. Celestone, dexamethasone (Hexadrol, Decadron, others), cortisone (Cortone), hydrocortisone (Cortef, Hydrocortone, etc. ), methylprednisolone (Medrol, Solu-Medrol, others), prednisone (Deltasone, Orasone, others), prednisolone (Prelone, Pediapred, others), triamcinolone (Aristocort, others), cyclosporine (Neoral, Sandimmune), tacrolimus (Prograf), azathioprine (Imuran), methotrexate (Rheumatrex), or other immune system suppressants. 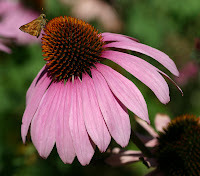 It is recommended not to use Echinacea if you have multiple sclerosis, white blood cell disorders, collagen disorders, HIV/AIDS, autoimmune disorders, or tuberculosis. Studies have shown that taking Echinacea cuts the duration of a cold or flu by half a day. That is not much and you may want to consider whether all the risks are worth it, or not. If you decide you want to give it a go, then don't hesitate to consult your doctor first. It may be wise to ask the pharmacist, or others who may have taken it and get their perspective and experiences on it. Two know more then one!